Sarkari Result: Every year, different government bodies and organizations conduct recruitment drive to fill up vacancies for different posts in various departments, offices, ministries and sectors under both Central and State governments of India. Lakhs of vacancies are announced every year for railway jobs, SSC jobs, banking and insurance jobs, defence jobs, etc. Candidates of all educational qualifications, from matriculation level, to higher secondary level and to graduation & above get the opportunity to secure a government job. So, lakhs of candidates appear for these exams. It is natural for candidates appearing for an exam to be eager to know their Sarkari result. If you want to know where and how to check your Sarkari Result for government job exams, you are at the right place. As government jobs offer stability, security, learning scopes and a great salary, tens of lakhs of candidates appear for these exams every year. The selection procedure varies from one exam to another. For example, some exams have just two stages (Prelims & Mains), whereas some other exams may have three stages (Prelims, Mains, and Interview). Sarkari Result of a particular exam is usually declared separately for each stage. This article on Sarkari Result will have all the information regarding results for various government exams. Read on to find out. There are various government organizations as well as autonomous bodies, like Staff Selection Commission (SSC), Railway Recruitment Board (RRB), Institute of Banking Personnel Selection (IBPS), etc. which conducts various exams every year. In the next section, we will look at the various exams conducted by these bodies. Detailed information about Sarkari Result for these exams will also be provided. The Staff Selection Commission, popularly known as SSC, conducts a gamut of exams to fill up vacancies in hundreds of posts in various departments, ministries and offices under the Government of India. Basically, it offers Central Government jobs. Separate exams are conducted by this body for candidates of different educational qualification. For example, SSC CHSL (Combined Higher Secondary Level) is conducted for candidates who have passed Class 12 exams. All the posts available in various government departments and offices for which the educational qualification of the candidate is higher secondary level are filled up through this exam. Likewise, SSC CGL (Combined Graduate Level) is conducted to fill up posts for which the required educational qualification is Graduation. SSC GD (General Duty) Constable is conducted for recruitment of constables in various paramilitary forces. The Railway Recruitment Board, RRB in short, conducts various exams for recruitment in various posts of Indian Railways. RRB comes under the Ministry of Railways and hence, RRB jobs are Central government jobs. RRB itself announces lakhs of vacancies every year for different posts, like Group D, Technicians, Assistant Loco Pilot (ALP), Railway Protection Force (RPF), Railway Protection Special Force (RPSF), NTPC, etc. These exams provide great scope for candidates to secure various entry level jobs in Indian Railways. There are many public and private sector banks and financial institutes in India. Every year, there is a requirement of candidates for various posts in these banks. For that, various exams are conducted. The most popular bank exams in India are for the posts of Probationary Officers (PO) / Management Trainees (MT), Clerk, and Specialist Officer (SO). The Institute of Banking Personnel Selection (IBPS) conducts IBPS PO, IBPS Clerk, IBPS RRB Office Assistant, IBPS RRB Officer Scale 1, IBPS SO, etc. every year for recruitment of POs, Clerks and SOs in the various public sector banks and Regional Rural Banks (RRB) in India. Around 20 public sector banks more than 50 Regional Rural Banks participate in the various exams conducted by IBPS. For recruitment of POs, Clerks, and SOs, the State Bank of India (SBI) conducts its exams separately. Apart from these two major recruitment bodies, various banks (both private and public) conduct exams based on their requirements. There are various insurance companies in India, each of which conducts there own exams for recruitment of candidates in various posts. The largest insurance company in India is Life Insurance Corporation of India (LIC) and LIC AAO is the most popular insurance exam in the country conducted for the recruitment Assistant Administrative Officers (AAO). Apart from LIC, other insurance company like Oriental Insurance Company Limited (OICL), New India Assurance Company Limited, etc. Now that you know everything about Sarkari Result for all these exams, you have nothing to worry about. Bookmark this page and stay updated about Sarkari Result release of the exams that you appear for. You must remember that clearing or not clearing the exam you appear for is not the end of the world. If you get selected, it is great. If you are unable to make it, there is nothing to worry about. Don’t feel disheartened. As you can see, in each of these categories, there are multiple exams that are conducted. So, stay confident and motivated. You will get other chances to reach your goal. Pull up your socks and prepare for the next exam. Master each and every topic in the syllabus and take a sufficient number of mock tests. Taking bank mock test series will be tremendously beneficial as the syllabus and pattern for most of these exams are same. You can take the bank mock test series on Embibe. These tests are available for free. 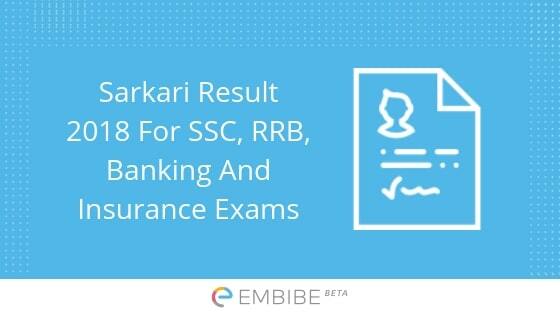 We hope this detailed article on Sarkari Result helps you. If you have any query, feel free to drop a comment below. We will get back to you.